Aquatic “SI approach” therapy senSI Swim is unique, it uses a Sensory Integration approach with the benefit of water, but best of all its FUN! Sensory Integration (SI) approach works on “integrating” all sensory information to allow the child to respond appropriately in their environment. 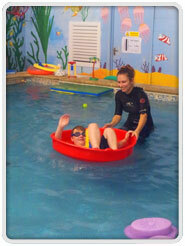 Sensory Integration Therapy through Swim provided at various locations specifically designed to enhance the experience for children. 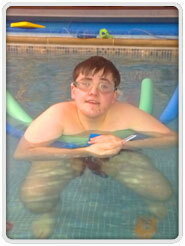 Same services as senSI Therapy services but treatment is in the water. 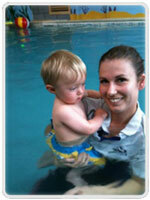 Learn to swim lessons and programmes – non swimmer to competitive, disabled, one to one, group, babies, children and adults. Research continues to support the concept that water is the ideal medium in which to rehabilitate the body, as well as develop oral motor and breathing control. Warm water provides a safe and supported environment, which not only supports the children, but also provides them with 30x more deep pressure to the body than air. This hydrostatic pressure is also unique as surrounds the child’s whole body. This pressure soothes, calms and organises the child. 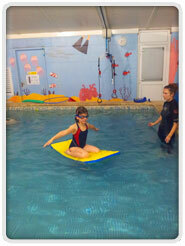 Moving around in the water also creates controlled vestibular stimulation and activities enhance proprioceptive feedback. All this enhanced sensory input helps with body awareness development, motor learning and provides the necessary sensory input the child craves. A person who has sensory processing difficulties may have particular difficulty coordinating all of the sensory signals that received from the environment. 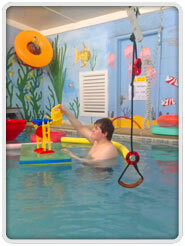 Aquatic therapy focuses on therapeutic, play-based functional movements that can help with many areas of difficulties but, most importantly, having fun.